Answer 221: According to Shia school of thought, such traditions are classified into da’if (weak) and are considered as fake. The following are some reasons by which these ahadith have been rejected. 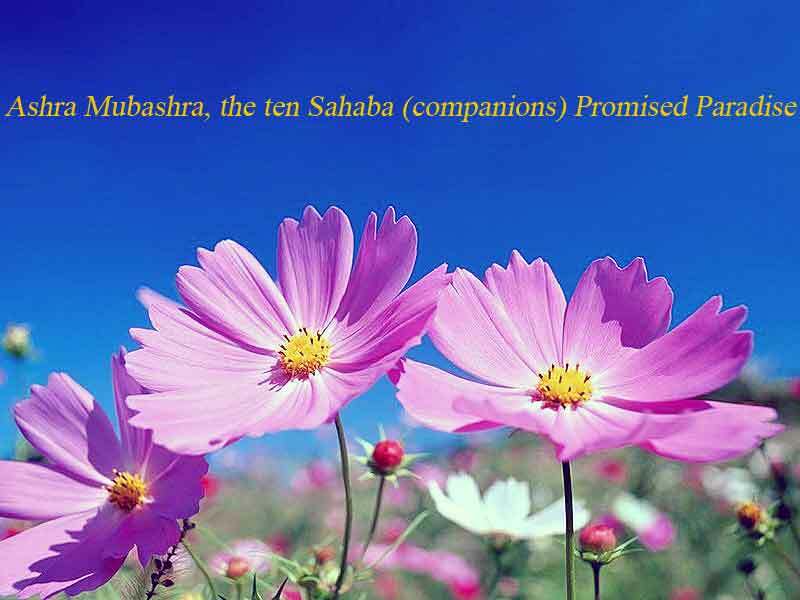 There are some traditions have been narrated by Sa’id Ibn Zayd and Zubair in which both but Imam Ali (as) were mentioned among those ten sahaba’s promised paradise (Ashra Mubashra). A question is now raised that how’s it possible that Imam Ali (as) was among them, but they refused allegiance to (like Abi Waqas) and fought against him? Zubaid said: “How is it possible that we were cursed, whereas we are among the 10 sahaba’s promised paradise?” The Imam (as) said, “If I knew you were among the dwellers of the heaven, I would never have fought against you!” Zubair said, “Didn’t you hear that the Prophet (saws) said, on the day of the Uhud battle, “Talha deserves heaven?” The Imam (as) said, “Name those who are promised paradise for me?” Zubair told him the names of nine people. The Imam (as) said, “Who is the tenth person?” Zubair replied, “You are the tenth one!” The Imam (as) said, “You confess that I am one of the dwellers of the heaven, but I deny those sahaba you named. They will be dwelled in a coffin at the lowest place of the Hell.” The Imam (as) said, “The Holy Prophet (saws) said it to me.” Zubair went back to his armies while he was crying! Conclusion: Although, this tradition has been mentioned in Sunni sources, it is classified as da’if (weak), according to the above mentioned reliable sources. Some of the sahaba mentioned in the hadith have been considered as unbelievers by each other, such as Othman who is considered an unbeliever by Talha and Zubair. Both (Talha and Zubair) have issued a fatwa, by which Othman has deserved to be killed, as he is Kafir. That’s why Othman has been killed by such fatwas! If this hadith is sahih, after choosing Abu Bakr as the first caliph, why did Omar order that anyone of the six persons that participated in the council, who may disagree with the decision, would be killed? If this hadith is sahih, why did Abdullah ibn Umar who has narrated this hadith deny allegiance to Imam Ali (as). Thus, this hadith due to the above mentioned reasons is not considered as sahih. It is such a fake and da’if one which has no reliable sources. Index: Shia Believe Ahlus Sunnah are Muslim not Kafir!, answer 203. Index: Ifk, the Slander / Shia Beliefs about Aisha, answer 180. Index: The Last Sermon of Prophet Muhammad (s) Delivered at Ghadir Khum / after Hajjatul Wida, answer 028.
 . Al-Tirmidhi, Muhammad bin Isa, Sunan al-Tirmidhi, Vol. 5, Pg. 648.
 . Ibn Uqdah Kufi, Ahmad bin Muhammad, the virtues of Amirul Momenin (as), researcher and editor: Hirzuddin, Abdul Razzaq Muhammad Hussain, Pgs. 166-167; Tabarsi, Ahmad bin Ali, Al-Ihtijaj ala Ahl e al-Lujaj, researcher and editor: Khorasan, Muhammad Baqir, Vol. 1, Pg. 162, Murtadha Publisher, Mashhad, first edition, 1403 A.H.
 . Tabari Amoli Kabir, Muhammad bin Jurair bin Rostam, al-Mostarshed fee Imamat Ali bin Abi Talib (as), researcher: Mahmoodi, Ahmad, Pg. 401, Kooshanpoor, Qom, first edition, 1415 A.H; Bahrani, Sayyid Hashim, al-Borhan fee Tafseer al-Quran, Vol. 5, Pg. 347, Bonyad Be’sat, Tehran, first edition, 1416 A.H.
 . Sheikh Sadouq, al-Khisal, researcher: Ghifari, Ali Akbar, Vol. 1, Pg. 303, office of Islamic publication, first edition, 1983; Ibn Kathir Basari, Esmaeel bin Omar, Jame’ al-Masanid wa al-Sonan al-Hadi, Vol. 3, Pg. 495, Dar e Khizr liltaba’at wa al-Nashr wa al-Tawzei, Beirut, second edition, 1419 A.H.
 . Khazaz Razi, Ali bin Muhammad, Kifaya al-Athar fee al-Nass ala al-A’imma al-Ithna Ashar, researcher: Hussaini Koohkamari, Abdul Latif, Pg. 181, Bidar, Qom, 1401 A.H; Sheikh Sadouq, etigadat al-Imamiyah, Pg. 105, Sheikh Mofid Congress, Qom, second edition, 1414 A.H.
 . Surah Baqarah, verses: 25- 82.
 . Amini, al-Ghadir, Beirut, Dar al-Kotob al-Arabi, 1397 A.H, Vol. 10, Pgs. 156-157.
 . Ibid, Pgs. 149- 161. This entry was posted in Dirayat al-Hadith, Hadith and tagged Abu Bakr, Ashra Mubashra, Hadith, Heaven, Holy Prophet (pbuh), Imam Ali (as), Jamal, Nahrawan, Sahaba, Talha, Umar, Zubair. Bookmark the permalink.